Charles Montague Graham came to politics via ‘tailoring’ on the Western Australian goldfields. Born in 1867 at Christchurch, New Zealand, eldest son of Patrick Graham, horse trainer, Charles Montague was educated and trained as a tailor in New Zealand. In his early twenties, he migrated to the Australian goldfields and by 1892 had set up as a tailor in Pell Street, Broken Hill. He married Katie, fifth daughter of Christopher Martin, on 17 March 1891 at a religious ceremony at his own residence. Some years later, the couple left for Western Australia where Graham worked on the Great Boulder Mine before going back to his trade as a tailor. He established a business in Piesse Street, Boulder, and was elected to the Boulder Municipal Council. A member of the executive committee of the Eastern Goldfields District Council of the ALP, in 1922 he became its president. In June 1922, he gained Labor preselection for the Senate for Western Australia and was placed third on the electoral ticket. Predictable rather than spectacular on the hustings, he spoke against the policies of the Hughes Government, especially in relation to its taxation policy, the wooden (‘coffin’) ships scandal, the fate of the Commonwealth Woollen Mills and the escalating price of sugar. Graham won office by virtue of preferences and the swing to Labor. Reviewing the election results, the Daily News commented: ‘We know little of Mr Graham, but what we know assures us that like Mr Needham he has the faculty and readiness to appreciate the other fellow’s point of view’. Very much a party man in debate, Senator Graham stuck closely to Labor’s policy. 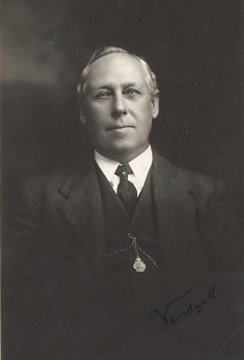 Throughout his parliamentary career, he worked in conjunction with his fellow Western Australian, Edward Needham, who from 1926–29 was Leader of the Opposition in the Senate. In his first speech, Graham enumerated issues high on his state’s agenda and these remained central to his mission. He drew attention to the need for a graving dock at Albany and objected to the sale of the Commonwealth Woollen Mills, commenting (understandably considering his business interests) that the mills had ‘proved a boon to the returned soldiers and others by promoting the establishment of tailoring shops and similar establishments’. Later, he affirmed that the manufacture of men’s caps should be protected, adding that anyone who thought otherwise was lacking in ‘true Australian sentiment’. He confessed that while he was ‘a representative of Western Australia’, he was ‘first of all an Australian’. He questioned the high level of profit taken by the Commonwealth Bank; its profits, he considered, should continue to go to ‘the people’. He queried also low pensions for the aged, and advocated a competitive national insurance scheme for the less advantaged. On the industrial front, he urged that arbitration was the proper medium for settling disputes and appealed for compassionate provision to be made for those suffering from work-related illnesses. By 1928, Graham had become an advocate of the ‘one big union’ movement, which he believed would reduce the number of strikes. In the Senate, he voted against a proposed amendment to the Conciliation and Arbitration Act, which would have provided for secret ballots. He upheld the interests of his mining constituency with a spirited plea for a gold bounty. He supported selective immigration in order to protect British migrants and, with Needham, went on to lobby Prime Minister Bruce on migration issues. Travelling widely around the State prior to the 1925 election, he was commended by the Western Australian branch council of the ALP for his ‘splendid work and great service’. In January, accompanied by Arthur Wansborough, MLA, he toured the south-west, visiting group settlements. In 1927, Graham was one of the Western Australian delegates at the ALP’s eleventh Commonwealth Conference, held in Canberra. He was elected to a committee reviewing the defence plank of the ALP platform. In one of his final speeches to the Senate, Graham expressed the hope that the time had passed ‘when men had, as it were, to crawl on their stomachs like snakes, and approach their masters with a request that they be allowed to work’. With his colleague, Senator Needham, Graham also lent his support over some months in 1927 to the initiative of Bessie Rischbieth and others concerning an area of land being set aside in Canberra for the headquarters of the Australian Women’s Commonwealth Organisations. After his defeat at the 1928 election, Graham moved to Victoria and lived at Clifton Hill in Melbourne. Minus his moustache and balding, the well-turned out former tailor was perhaps not as dapper as in his youth; nevertheless, sturdy and in good health, he found work as a storeman for the Country Roads Board and was soon on the committee of the Victorian Federated Storemen and Packers Union. After a short illness, he died in Melbourne on 27 March 1938 and was buried in the Heidelberg Cemetery. His wife Katie and one daughter, Wilmot Jane, survived him. The Senate recorded the ‘high esteem’ in which he was held by his colleagues. Great Southern Herald (Katanning), 6 December 1922, p. 2; Kalgoorlie Miner, 14 December 1922, p. 4; Daily News (Perth),11 January 1923, p. 6. CPD, 11 July 1923, pp. 882-885, 4 June 1926, p. 2645, 4 February 1926, p. 646, 27 August 1925, pp. 1751–1752, 24 July 1924, pp. 2429–2430, 27 August 1925, p. 1754, 5 August 1926, p. 4938; ALP Papers, SAWA. ALP, Official report of proceedings of the eleventh Commonwealth conference, Canberra, 11 May 1927, Melbourne, 1927, pp. 13, 19, 20, 25; CPD, 13 March 1929, p. 1064, 15 March 1929, pp. 1288–1289. Letter, Graham to Australian Federation of Women Voters, 24 November 1927, Rischbieth Papers, MS 2004/5/521, NLA; Argus (Melbourne), 29 March 1938, p. 9; CPD, 27 April 1938, p. 531. This biography was first published in The Biographical Dictionary of the Australian Senate, vol. 1, 1901-1929, Melbourne University Press, Carlton South, Vic., 2000, pp. 372-374.